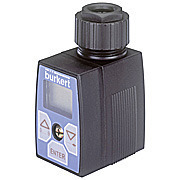 Incorporated in the year 2005, our company, Burkert Contromatic Pvt. Ltd. is widely known today as a professionally managed organization engaged in manufacturing and supplying a wide range of Sensors, Solenoid & Pneumatic Valves. Our wide range of products includes Solenoid Valves, Pneumatic Valves & Control Valve. The products are made from best quality raw materials and are admired and demanded by clients for their unique features like smooth operations, strength, precise designs and long functional life. Our company is known for ensuring timely delivery of products in a highly professional way. Our production engineers employ modern production techniques and high-grade materials in the manufacturing process in order to develop reliable products for the clients. That is why, customers all around the world repeatedly demand these products. Our advance machinery based on latest technology have led us miles ahead of our competitors. Our manufacturing process is streamlined for fulfilling the diverse requirements of the customers.